Taj Mahal explored umpteen times, in broad day light excites not much for those planning the nearest vacation from Delhi. But Taj at night, or rightly by moonlight is a whole new sight and experience to explore. Well holidays and full moon synced on 30th Sept to help us utilize our weekend dating the epitome of love. Any planner would find refuge in our Google, so did we, to know the process to book tickets and whether it could be done online and so on...Now the next question was tickets. A little could I find in their official site http://asi.nic.in/asi_monu_whs_agratajmahal_night.asp and could hardly find any experiences or travelogues penned by a previous visitor. The tickets are only available from their tourism office in Agra so felt it better to have a travel agent commissioned for the job. He guided us with the hotel reservations in Agra and Bharatpur also. Sunday 30th - Agra, View Taj at night. Usually we start early morning to avoid traffic on NH2. But this time we started lazily by 10.30 thanks to Yamuna-Expressway and by 1 pm we were at Agra. Yamuna expressway drive was totally uneventful. Post lunch we all were out in Sadar Bazaar shopping as our time slot for night visit was at 9.30 pm. We reached shilpgram by 9 and after the document verification and security check we were escorted in a mini van to the East gate. The entire area is filled with CRPF police, and barricades are placed to avoid local people. Again at East gate all our tickets were checked and security check done before we entered the Taj complex at the scheduled time. Viewing : 2 nights before full moon, full moon night, and 2 nights after full moon ie a total of 5 nights. Buying Tickets : Only one day before and is available only at Agra. 400 tourist per night allowed : 8 batches of 50 people for 30 minutes. Timing : 08:30 pm to 12:30 pm. I think the best time would be 10:30 or 11:00 pm. Buying tickets : Book a hotel and these guys should help in buying tickets. DOCUMENTS REQUIRED FOR BOOKING : Photos IDs with address and age. You need to carry the originals while visiting. Though nobody verified the same at the security. Camera bags are not allowed. We had to keep our empty bag in locker. You can carry additional lens. Tripod not allowed. Video camera not allowed. Preferably stay near Shilp Gram - Near East Gate one has to report here first. There are lots of hotels there. We stayed in The Retreat. We walked down from there. You have to report @ shilpgram 30 mins before the schedule time. Time schedule is strictly followed. Photography is very difficult as there is no light and long exposure without tripod is almost impossible. Shot pics at high ISO and managed to get a couple of shots. You have to be there to actually enjoy the beauty. After the guests walk-in, the sandstone area is blocked, and the lights switched off for half an hour. 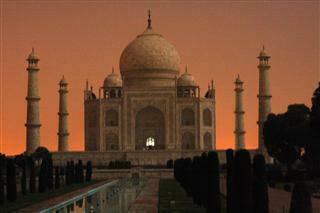 At first everything appears dark but slowly our eyes get adapted to the darkness and the moonlit Taj begins to glow. There were quiet a number of Indian as well as foreign tourists also in our batch. Its not about photography or recording, its just the white colossal Taj reflecting the moonbeams standing still and subtle conveying the message of love and beauty much quite high than our thoughts can imagine. Fatehpur Sikri is around 35 kms from Taj mahal. The city came to be known as Fatehpur Sikri, the "City of Victory", after Akbar's victorious Gujarat. The Buland Darwaza was built in honor of his successful campaign in Gujarat, when the city came to be known as Fatehpur Sikri - "The City of Victory"
A white marble encased tomb of the Sufi saint, Salim Chisti within the Jama Masjid's courtyard.